A housekeeper first told Anita Miranda that she and her family had to leave the hotel room that the Federal Emergency Management Agency had been paying for after Hurricane Harvey forced them from their home. When Miranda, 24, went to the Houston Inn and Suites' front desk, an employee confirmed it: "Oh yeah, y'all are not extended," she remembers them saying. Miranda and her eight family members had an hour to empty out the two rooms they had occupied for two-and-a-half months. 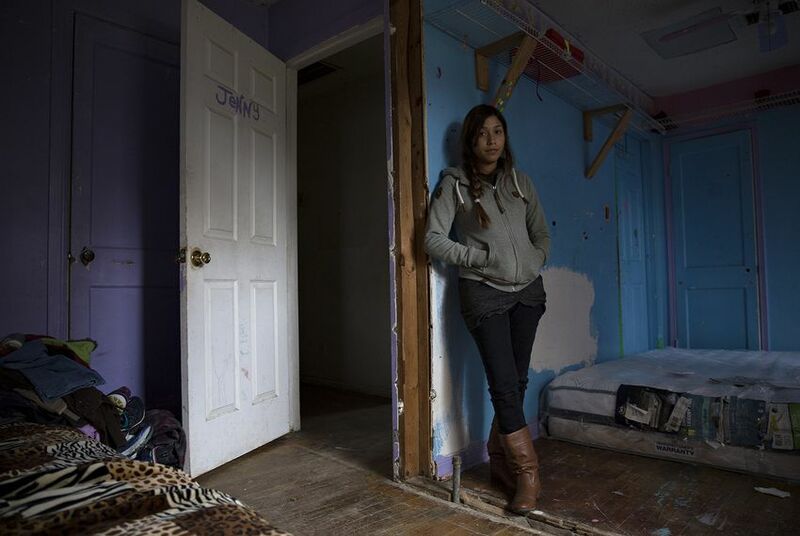 When FEMA cut off their hotel assistance on Nov. 28, the family returned to their gutted home, where five of them — Miranda, her mother and three teenage siblings — have been sharing two mattresses they got at a furniture bank. "We've been at the house because there's nowhere else to be, but there's no water, no light, no restroom, no nothing," she said. They use the bathroom at a neighbor’s house, cook at her grandmother's and cover themselves up with several blankets at night because the heating system is broken. "We just try to spend the majority of the time elsewhere," Miranda said. Hurricane Harvey sent three feet of water into their house in East Houston's Denver Harbor neighborhood and caused the roof to cave in. After the storm, the family qualified for help through FEMA's transitional sheltering assistance program, or TSA, which pays for hotel or motel rooms for families whose homes are uninhabitable or inaccessible because of a disaster. FEMA implemented the program on Aug. 29 – four days after Hurricane Harvey first made landfall on the Texas Gulf Coast – to ensure families displaced by the storm had somewhere to stay. Enrollment peaked at more than 24,000 families in late September; since then the number has dropped to about 11,300 families as of Friday. While the criteria FEMA uses to decide whether a family qualifies for the program is precise — FEMA's general guidelines to determine who is eligible are public and easy to find — the process for terminating the assistance is fuzzier. But Miranda says FEMA didn't inform her that her family was being cut off, and when she called the agency's hotline after getting the news from the hotel, the representative didn't give her a clear answer. "She said, 'It goes through a system, we don't have control over who gets extended and who doesn't, so I'm sorry you're going through that, but there's nothing we can do,' " Miranda said. "There is a process to get into the program, it's getting out of the program that I don't know that there is a process," said John Henneberger, co-director of the Texas Low Income Housing Information Service, an Austin-based nonprofit that researches housing solutions for low-income people. Tracy Figueroa, an attorney who heads the disaster response team at the Texas RioGrande Legal Aid, agrees, adding that in previous disasters she has seen FEMA using rules that weren't available to the public or even to the attorneys helping disaster victims. "There are unpublished rules that FEMA uses internally to make some of these decisions," Figueroa said. "If they were transparent, there would be less confusion for people." Disaster victims can check the status of their assistance application on FEMA's website, but frequently it will only say when they were deemed eligible for the hotel program, not whether the benefit was extended or canceled. "What they are being told and what is happening to them doesn't match what's in their account" said Linley Boone-Almaguer, an attorney at Texas RioGrande Legal Aid. "It's misleading and often not up to date." FEMA confirmed that information about terminations isn’t available online and said it’s kept in disaster victims’ files accessible only by FEMA agents. "The reason for not being extended is in everyone’s case and varies case by case," said FEMA spokesman Bob Howard, adding that the only way a family can check their status is to call the agency's hotline or go to one of FEMA’s disaster recovery centers spread throughout Harvey-affected areas. Miranda posted her experience in a Facebook group for Hurricane Harvey victims with more than 140,000 members. "Anyone else get kicked out of their hotel room today?" Miranda posted on Nov. 28. She got reactions from 50 people and 29 comments, including one from Beaumont resident Sherrie Foster. Foster, 53, said she left her home with her two grandchildren, ages 4 and 5, on Aug. 27 and after a couple of days staying with her neighbor's family in Orange, she drove to Salisbury, North Carolina, where she had family members who could help her. Foster and her grandchildren were approved for FEMA assistance and checked into Salisbury's Comfort Suites on Sept. 15. She said FEMA told her on Dec. 9 that her aid would not be extended because the agency had decided that hotel stays outside Texas would no longer be accepted. "The representative said that there's plenty of hotels in Texas and that I should just come back to Texas,” she said. “But there are no vacant hotels where I'm from." Then, on Dec. 12, FEMA contacted Foster again to say her hotel stay had been extended. But a couple of hours later, the hotel manager told her that the agency had reversed the decision. After some back and forth with the hotel and FEMA, she finally got a definitive answer. "I called FEMA/TSA back around 6 p.m. and the rep said that no, my stay ended today and that I had not been extended,” Foster said. “I asked her to read the notes and she said that she was sorry and that it must have been a computer glitch because she had another caller earlier saying the same thing." "The stress of all this is really taking a toll on me." On Dec. 2, FEMA and the Texas Division of Emergency Management decided to pay for hotel stays only in Texas and Louisiana because there’s a shortage of available housing in both states due to Hurricane Harvey. Displaced people who have gone to other states can use rental assistance granted by FEMA rather than the hotel program, the agency said. Foster said she received a one-time rental assistance of around $1,600 to get an apartment in September, but had to move out because the heating system was broken. She says FEMA has told her she must sign another lease before she can get rental assistance again, but she's afraid FEMA won’t follow through. Until she finds a new rental, Foster will stay with family members in North Carolina. 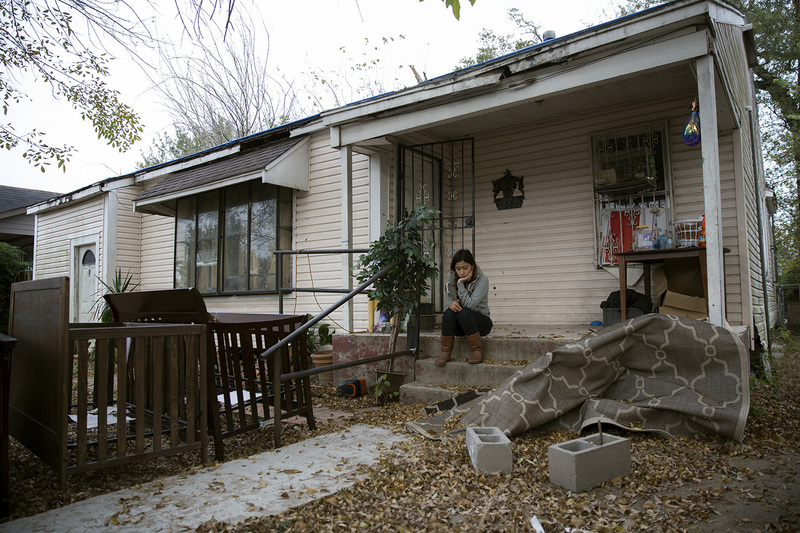 According to FEMA, 1,684 families of the 11,335 currently in the TSA program have been approved for short- and long-term housing programs funded by FEMA and administered by the Texas General Land Office, which provides mobile homes, grants for home repairs or a direct leasing option in which local governments sign leases on behalf of Harvey victims. Harvey victims who are still in FEMA-paid hotels could see that assistance end on Jan. 16 – the third deadline the federal agency has set for the program. The number of people staying at hotels has been decreasing steadily since October, but the sharpest drops happened close to the two deadlines previously announced by FEMA – Oct. 24 and Nov. 27. In those weeks, the number dropped around 20 percent, while the sharpest decrease in other weeks was 14 percent. Howard, the FEMA spokesman, said TSA recipients are assigned a long-term recovery case manager to help them develop a housing plan. Miranda said her case manager only gave her a couple of Walmart and gas gift cards, while Foster said she has called FEMA about that option, but the agency never assigned her a case manager. "I feel like I'm just a number to them," Foster said.